August started with a broken motor mount on Yellowstone Lake. Luckily Anderson and Becker were cool about it and were happy just listening to trap music and eating fried chicken. I fished with Bill and Paula who are long time regulars who I’ve always loved fishing with. We floated the dam stretch and had superb dry fly fishing. Late night we found ourselves drinking manhattans and eating the best steak of my life. Then my friends Ryan and Dane came to town from Gunnison Colorado, young fly fisherman on their way off to college. Their passion for fly fishing reminds me of my youth. I’m sure they worked hard all summer and saved their money so they could come fly fishing out here for a couple days before school started. I had the pleasure of fishing with the Williams family, friends for the last few years now. Jen and Ryan were in my boat when we jumped out and hunted a little side channel where Ryan caught a monster Cutty. Probably the best one of his young life! My friends Chris and Todd came to town from Austin. We tried to fish last year while the river blew out from under us, and the rain came in heavy. Luckily this time we had stellar fishing and a fantastic trip. Then I guided Linda from Texas who literally just packed up her truck and decided she was going to go to Wyoming and try fly fishing. I thought that was the coolest thing. People have guts. Then I was lucky thought to fish with my friend Jack and boy we had a great trip on the snake. It’s always a pleasure and Jacks antics are hilarious. On the 8th I got rained out with a good friend of mine. Bill and I tried hard to stick it out in the rain but it got cold and wet and we caught a few fish so decided to call it early. Then I guided doctor Dave and his family from Boston. Mike and Kelly came in to town after their last visit three years ago. Unfortunately we only had one day together but made the most of it. Kelly caught a bunch of fish on her first day fly fishing, Mike was just happy to sit and drink scotch and watch his wife catch a bunch of fish. We caught one fish that was so incredible we decided to just sit there and drink a scotch for a minute in pure celebration. I’ll see you in October Mike. I then got cancelled on one day and decided to go fishing and hiking for myself. So Jess and I packed up the car and went way up into the hills and laid out a picnic and caught beautiful brook trout on every cast. The flowers were so incredible that day. I tried to float Moose-Wilson with Teddy and Anderson but the flows were still so high it was literally impossible. You really have to be on your game for that float at those flows. We caught a few fish still and had a great day. The smoke started first in Idaho then Montana and Oregon. An ominous and lingering feeling of depression consumed the valley. Suddenly the day to day things that we live for like fishing, biking, and hiking became less important. When I was a kid I can’t seem to recall this much smoke. I remember the green knoll fire, I remember a couple Jackson Lake fires, but I can’t seem to remember thick smoke for months on end. You can’t help but think about your place in the world and in this little valley and wonder if things are changing. Luckily we didn’t have any fires near us, and we had plenty of cold water for our trout. So this summer was overall fantastic fishing. I can’t believe it’s already over. Luckily I got to spend it with people who love fly fishing. Like Stuart and Mary from Scotland, like my friend Bill and Tally, or Skip and Katie who managed to land a 20 inch fish in a small spring creek side channel. I had a great trip with Ciara and Suzanne as well. Floating Deadmans to Moose for her first time, Ciara caught a few great fish on the fly. Susan and Mike from Park City joined me and we had the time of our life. Fishing was slower but since I brought a great lunch, the day was not ruined. Mary and I floated a short day down in the forest the day before the eclipse with Oz the most well behaved boat dog ever. On eclipse day, I had a plan all set for Jess, Jill, Steve and I. We dumped the boat the night before, so we could avoid traffic trying to do the shuttle that morning. We were up at 6 getting everything together for the big day. Steve and Jill brought all the best wines and Jess and I packed a sweet lunch. There were other like minded people at the boat ramp early trying to start the 14 mile float from Moose down to Wilson. We fished hard that morning until the first sliver of moon appeared in front of the sun. I had a spot for a nice picnic planned so we pulled over and enjoyed the show. Like a dumbass I thought it would be funny to just run and dive into the water with all my clothes on as a way to commemorate the once in a lifetime moment. As the moon blocked out more of the suns rays, the temperature dropped dramatically, there were more birds than usual at the rivers edge, the first stars began to appear, and the Tetons grew dark. I was beyond freezing at the point of totality. It was one of the most awesome and dramatic moments of my life. 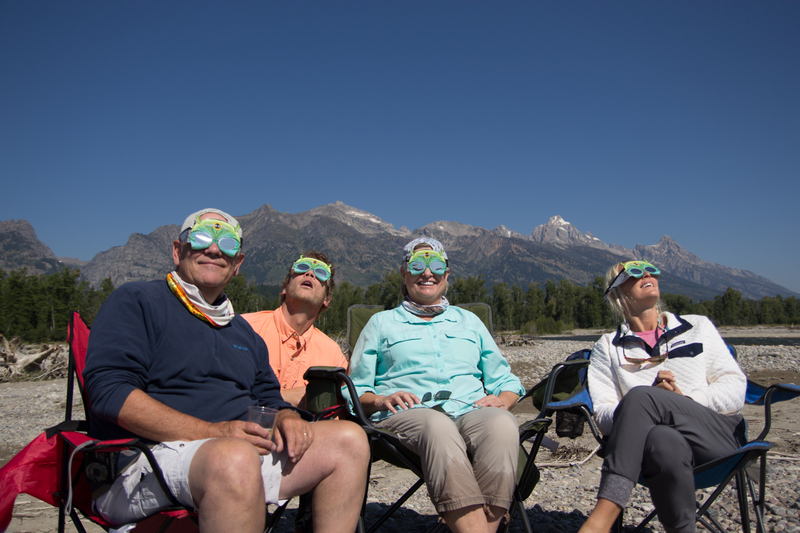 To be sitting there with great friends, as the moon blocked out the sun, and cast a beautiful moon shadow over the Tetons. At that moment millions of Americans were staring up into space at the same moment and it was beautiful. I looked to the South and to the North. I had a sip of my wine, I noticed a commercial airliner up in the sky doing circles so that both sides of the plane could get a view of the white ring. I took a deep breath and sat back in my chair and wondered what the fish were up to and thought I should go catch one for an epic picture, instead I drank more wine and decided to sit and enjoy it. And it was a fleeting moment that should have lasted longer. Just like that the Tetons were glowing red again and seconds later the sun came out. And only 5 minutes later, it was like it had never happened. So we packed up camp and went fishing. The fishing remained good for the next few hours. It’s safe to say the eclipse did not affect the quality of the fishing or the fish for that matter. Mark and Sue joined me the day after the eclipse. Sue and I caught a beautiful fish in a side channel and later said that was the best day of fishing they have ever had. I love hearing that. Candy and Bucky, Amy and Nico, Then Sue from Boston just decided to pick up a fly rod and start double hauling for christ’s sake. Never seen a beginner pick it up that quick. 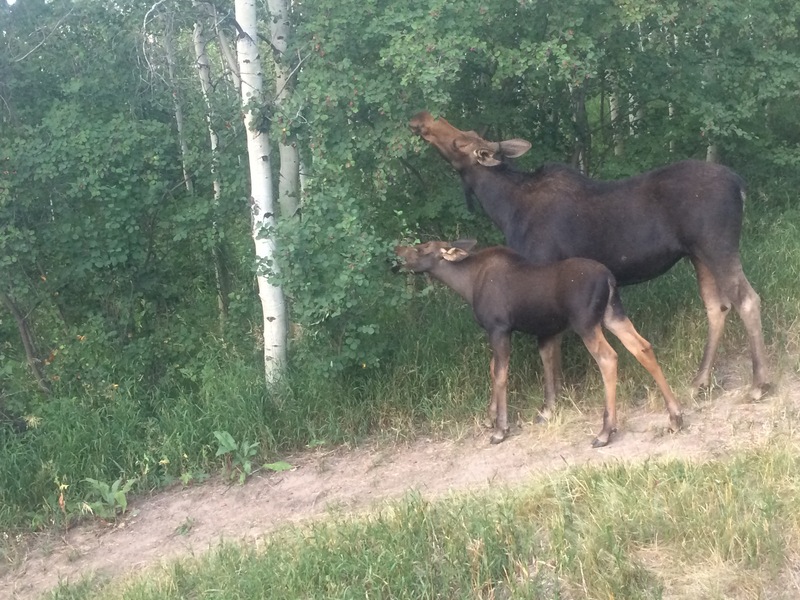 Then my old friend Pete and I explored Moose to Wilson and found some great fish in small water. I love fishing with clients year after year. Greg and Roberta and I floated the Dam stretch and caught some great fish together. I really enjoy putting people on fish and the most common question I get is, don’t you ever just want to grab the rod and catch the fish yourself? The answer is sometimes yes, but most of the time I love guiding people to a fish, and if it all goes right eventually you may just catch that fish. And that to me is pure satisfaction. Half way to to your destination in the middle of Yellowstone lake and the motor fails!